Each pattern describes the circumstances in which it is applicable, when it can be applied in view of other design constraints, and the consequences and trade-offs of using the pattern within a larger design. All patterns are compiled from real systems and are based on real-world examples. Each pattern also includes code that demonstrates how it may be implemented in object-oriented programming languages like C++ or Smalltalk. I believe the famous recommendation of "favor composition over inheritance" was coined in the GoF Design Patterns book. Ideally, you shouldn't have to create new components to achieve reuse. You should be able to get all the functionality you need just by assembling existing components through object composition. But this is rarely the case, because the set of available components is never quite rich enough in practice. Reuse by inheritance makes it easier to make new components that can be composed with old ones. Inheritance and object composition thus work together. Nevertheless, our experience is that designers overuse inheritance as a reuse technique, and designs are often made more reusable (and simpler) by depending more on object composition. You'll see object composition applied again and again in the design patterns. Notice that this statement refers to class inheritance, and must be distinguished from interface inheritance which is fine. Both are ways to achieve reusability, but the advantage of composition over inheritance is dynamism. Since the composition can be changed dynamically at runtime this represents a great advantage, whereas inheritance is statically defined at compile time. Also, composition is based on using the public interfaces of the composed objects, therefore objects respect each other's public interfaces and therefore this fosters encapsulation. On the other hand, inheritance breaks encapsulation since child components typically consume a protected interface from the parent. It is a well known problem that changes in the parent class can break the child classes, the famous base class problem. Also in inheritance parent classes define the physical representation of subclasses, therefore child clases depend on parent classes to evolve. Another advantage of composition is that it keeps classes focused on one task and this foster cohesion as well. Evidently a problem with composition is that you will have more objects and fewer classes. That makes a little more difficult to visualize your design and how it achieves its goals. When debugging code it is harder to know what is going on unless you know what exact instance of a given composite is currently being used by an object. So composition makes designs a bit harder to understand in my opinion. Since the advantages of composition are multiple that's why it is suggested to favor it over inheritance, but that does not mean inheritance is always bad. You can achieve a great deal when inheritance is properly used. I would suggest a study of GoF Design Patterns to see good examples of both types of reusability, for instance a Strategy Pattern that uses composition vs a Template Method that uses inheritance. Most of the patterns make a great use of interface inheritance and then object composition to achieve their goals and only a few use class inheritance as a reusability mechanism. If you want to delve more the book Holub on Patterns, on chapter 2 has a section called Why extends is Evil that delve much more on the liabilities of class inheritance. Losing Flexibility: The first problem is that explicit use of a concrete-class name locks you into a specific implementation, making down-the-line changes unnecessarily difficult. Coupling: A more important problem with implementation inheritance is coupling, the undesirable reliance of one part of a program on another part. Global variables are the classic example of why strong coupling is bad. If you change the type of a global variable, for example, all the code that uses that variable—that is coupled to the variable—can be affected, so all this code must be examined, modified, and retested. Moreover, all the methods that use the variable are coupled to each other through the variable. That is, one method may incorrectly affect the behavior of another method simply by changing the variable’s value at an awkward time. This problem is particularly hideous in multithreaded programs. Fragile-Base-Class Problem: In an implementation-inheritance system (one that uses extends), the derived classes are tightly coupled to the base classes, and this close connection is undesirable. Designers have applied the moniker “the fragile-base-class problem” to describe this behavior. Base classes are considered “fragile” because you can modify a base class in a seemingly safe way, but this new behavior, when inherited by the derived classes, may cause the derived classes to malfunction. What do I expect to learn? When can I apply what I’ve learned? For design patterns I could expect several visual tools or "job aids". Why are Design Patterns so hard to learn? How to select a Design Pattern? How to use a Design Pattern? Cover various GoF design patterns with examples – Show examples of code before applying a design pattern, and how it looks after like Vince Huston does in his examples. As already mentioned, design patterns are really ideas, so when teaching you must convey the idea. If they understand the problem, solution and consequences of the design pattern, then they will be far better off than trying to force patterns into the code (and that will become a nightmare). Recognition of where and what patterns (if any) can be applied is the real goal. The Huston examples are really good for putting out an example of code to the class and seeing if they can identify a pattern to improve it. Hope this helps. Head First Design Patterns is an excellent reference as well. I think the first thing that is needed here is a good / appropriate data structure to keep / manipulate the table data. That depends on specific requirements you can have, such as size of the table, performance requirements, etc. Let's assume you will use some Matrix class which provides low-level operations over table (set cell value, add/remove row, transpose, etc). This class will operate with basic data structures, for example, it may have get_row method which will return a list of numbers. Now we can, for example, get the summary of values in this list, but we can't just change some list item and have this change reflected in the parent Matrix (the row data is disconnected from the parent matrix structure). row, column and cell objects all connected to the parent Table object (if we modify the row item, it will be reflected in the parent table and other row / column / cell obejcts). """The base data structure, implementation detail.""" """Returns cell value by x/y column and row indexes.""" """Sets cell value by x/y column and row indexes.""" """Returns `list` of values in the `index` row.""" """Returns `list` of values in the `index` column.""" The Matrix class is a low level data structure and it should not be a part of a public interface. """The user-level interface to work with table data.""" # The "_data" object is private, only to be used internally. """Returns `Row` object by row number (1, 2, 3, ...).""" """Returns `Column` object by string name (A, B, C, ...).""" """Returns `Cell` object by string name (A, B, C, ...).""" """Register an observer to be notified when Table state was changed.""" """Notify all dependent objects about the state change.""" To keep Table and Row / Column / Cell objects in-sync we can use the Observer pattern. Here the Table is a Subject and Row / Column / Cell are Observers. Once the state of the Table (and underlying data) is changed, we can update all dependent objects. Fetches the `list` or row values from the `Matrix` object. # agreement on how these classes should work. # See also the comment in the `remove` method below. """Returns sum of row items.""" # call `parent._notify` here to update other objects. # we would have something like `self.parent._remove_row(self.index)` here. # so it will no longer observe the `table` changes. Using this approach you can quite easily implement such operations as copy, cut, paste. Also you can apply Command pattern here and extract these operations into small classes. This way it will also be quite easy to implement undo and redo. # Group by column "A" and use `SumAggregator` to aggregate grouped values. Of course, the above is just one of many possible implementation options, treat them as some ideas that can be useful (or not useful) depending on specific requirements you have. You may find more ideas in the GoF patterns book. Decorator adds responsibilities for an object dynamically. Let's say we need to count the number of times an item is added to a Set (a kind of instrumentation detail). We have Set interface in java and we can implement a decorator to add the instrumentation behavior to an existing Set implementation like so. There are lot more examples for Decorator pattern that you better take a look. For an instance, say you are developing Window based GUI application. You may need to add borders to the window, a scroll bar and so on. Some times you may need to add any combination of those. That is a good use of Decorator pattern as stated in the famous Design Patterns book  by Gamma. I would suggest you read this book  to find more about design patterns. 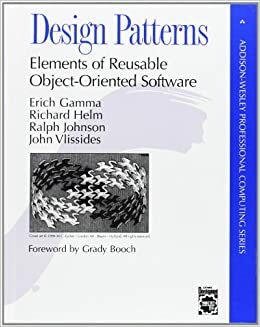 Design Patterns: Elements of Reusable Object-Oriented Software doesn't use JS for it's examples, but is highly regarded in learning design patterns. Again, not saying you need to read it cover-to-cover, but if you didn't even know it existed then that's likely a problem. Note the repeated author names. :) Some of these might be a little beyond you since you're a freshman. I put a star in front of the ones that you might want to wait on until you've got more fundamentals built up. You don't have to wait for your school to teach them to you though. A great way to jump-start your knowledge is to buy an Arduino experimentation kit (like Adafruit's ARDX) and learn how to use it. You'll get to play with where the code meets the hardware and you'll learn enough electronics knowledge to go all sorts of different directions. Edit: almost forgot; teach yourself to draw like a mechanical engineer. There's likely an into to mechanical drawings course for the frosh Mechos, take it if you can. It comes up more often than you'd think and it'll help you learn to effectively communicate ideas visually. It is good that you have started organizing your code into objects, this is a good move into the better application structure. Once when you start looking deeper into it, you will find ways to split your current objects into even smaller parts and organize them in better ways, having less code solving more problems in more flexible ways. For example, in your code the business logic is still tightly coupled to the database. What if you decide to use mysqli instead of PDO? You'll have to touch every class in your application. But if the database interaction was extracted into own set of objects that were used by your business logic, it would be much easier to replace the database access layer. In fact, you could quite easily replace MySQL with PostgreSQL or even with plain files in that case. I can think of two ways to learn more about how OOP works: read a book or learn from the existing code. The book I linked is my favorite OOP book and shows some very good examples of how the problem can be solved with OOP by decomposing the program into the co-operating objects. And I'd also recommend starting using some OOP framework, I had some good experience with Yii in the past, check the guide to see how it looks like. You'll see tons of useful objects solving various problems you have to solve all the time when developing a web application. Try to build some simple application with it and then try to look inside the framework code to see how it actually works. One more advice is to look into automatic testing. This will not only keep your application alive, but will teach you how to compose better objects. You'll have to use your classes in two different situations - your actual code and tests. Inside tests you will want to isolate the object you are testing from the rest of the code, for example, test the sales stats algorithms without touching the database. And you'll have to split you code into smaller and more flexible structure to be able to do that.